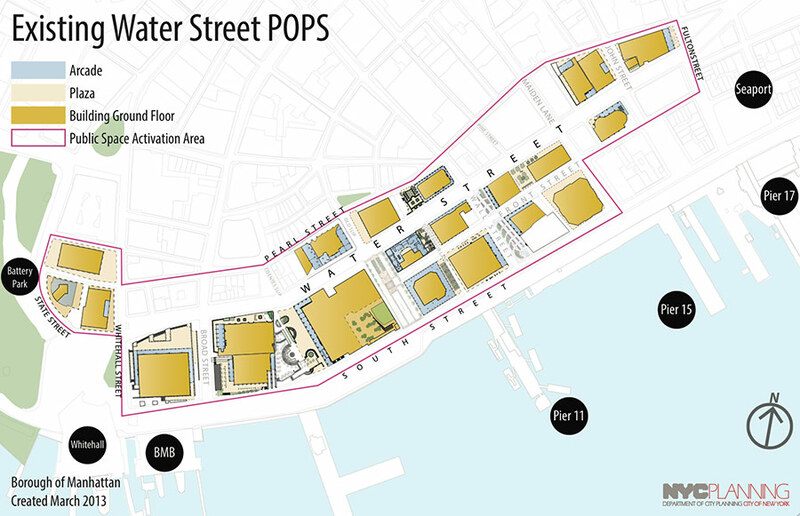 After much debate, the New York City Council passed the Water Street Upgrades Text Amendment on June 21, giving 110,000 square feet of privately owned public spaces (POPS) to the developers and owners of 17 buildings in lower Manhattan to infill. 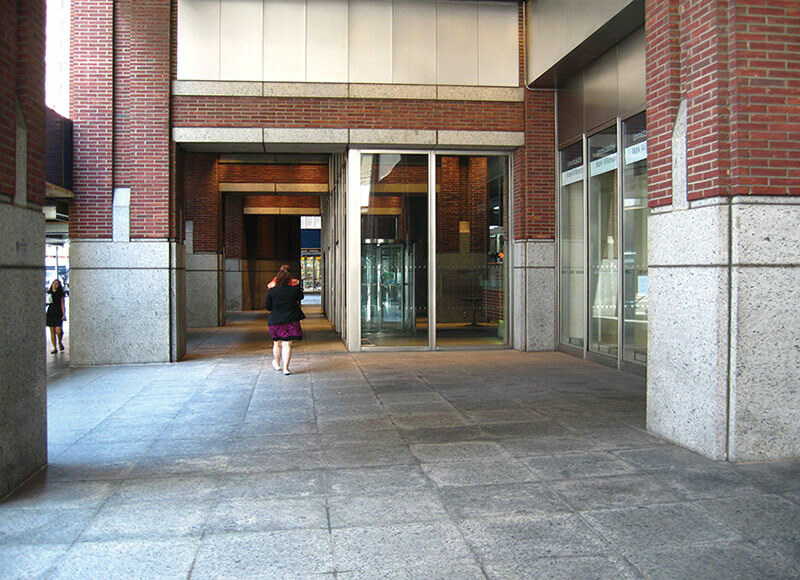 These specific POPS are defined as arcades—covered pathways originally intended to offer pedestrians continuous coverage and protection in inclement weather and provide places of respite. In the 1960s, developers were given additional square footage in the floor area ratio (FAR) in exchange for providing these spaces to the public. However, when these spaces were created, there were different design preferences and standards than what we have today. The modernist arcades are devoid of ornamentation, offer varying degrees of sightlines due to the overhangs and columns, and have deteriorated over the decades. The amendment would allow commercial infill in these spaces, ideally to better serve the community than the arcades did. 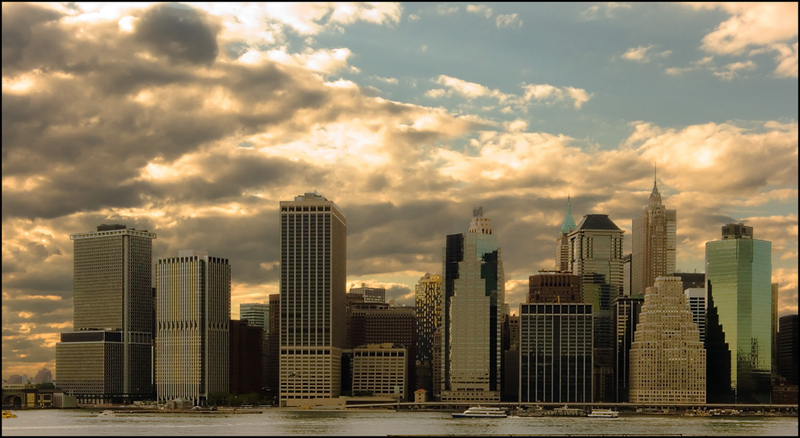 However, Harvard professor Jerold S. Kayden, author of Privately Owned Public Space: The New York City Experience, said, “I think it would be a mistake to view this as anything more than dealing specifically with the conditions of the Water Street POPS.” The New York Department of City Planning and the Municipal Art Society also worked on the book; together they evaluated over 500 POPS spaces in New York and issued five different classifications: destination, neighborhood, hiatus, circulation, and marginal. 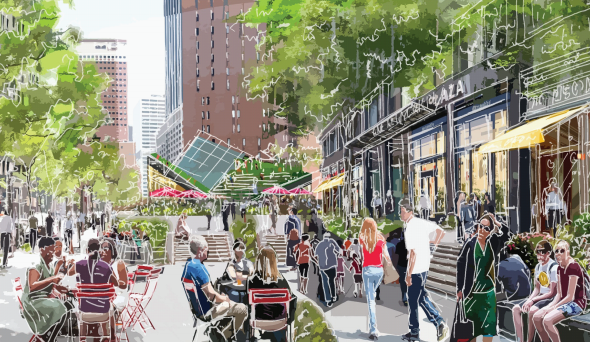 In the current amendment, the owners are responsible for revitalizing the nearby plazas to better serve the public, but exactly how that might play out is unclear. Our verdict? Watch these spaces—good things may or may not be coming. The City Council's Subcommittee on Zonings and Franchises voted yesterday to approve a proposal that would trade 110,000 square feet of Privately Owned Public Spaces (POPS) on Water Street to private developers. Although the Water Street Text Amendment will go before the full City Council on June 21, its passage in the subcommittee all but assures that the highly controversial measure will pass next week. The amendment will enable developers to build retail storefronts along 13 square blocks of the Water Street arcades (known as POPS) but the building owners will not be paying for the new spaces: Developers just will be on the hook for renovating the tower-adjacent public space and making the hardscaping stormproof. The Water Street arcades are a far cry from the ones in Walter Benjamin's Paris, but the lower Manhattan spaces still serve a vital public function. Like all POPS, they were a quid pro quo that let developers build taller towers in exchange for providing publicly accessible space for as long as those buildings existed. In May, The Architect's Newspaper launched a design charrette for the Water Street POPS to start a conversation around turning these mostly dreary and neglected spaces into vibrant gathering spots and successful corridors they once were. AN also provided testimony opposing the Water Street Text Zoning Amendment for a May 27 meeting of the Subcommittee on Zoning and Franchises. Councilmember Margaret Chin, who represents the district that includes Water Street, initially opposed the amendment, but now, after negotiating a few modifications, Chin has expressed her support. (Although Chin isn't on the Zoning and Franchise subcommittee, she's the district representative, so custom provides her buy-in with weight.) Modifications include an exception for arcades larger than 7,500 square feet to go through a Uniform Land Use Review Procedure (ULURP) review. 6 of 17 plazas will consequently be subject t0 a more intensive review before development. Other changes include limiting the frontage of drug stores and banks to 50 and 30 feet, respectively. Chin later expounded on her decision: "This wasn't an easy decision to make. There have been many passionate voices that wanted this proposal to be rejected outright, or conversely, wanted the text amendment passed as is. After much deliberation, I came to the conclusion that neither option would give our community what it desperately needs and deserves: Improved public spaces in plazas and arcades, small-scale neighborhood retail, and innovative indoor public spaces," The Broadsheet reported. Alice Blank, architect and co-chair of CB1's Tribeca Committee, expressed her profound distaste for the decision: "Now, in behind-closed-doors meetings with the powerful lobbyists for the developers, the City is giving away these public spaces without ever gauging their true value and without obtaining any meaningful commitment from the developers to equitably compensate the public." The Land Use Subcommittee is set to vote on the amendment today. After Hurricane Sandy swept through the east coast, it left Water Street, a sleepy corridor in lower Manhattan, even more deserted. 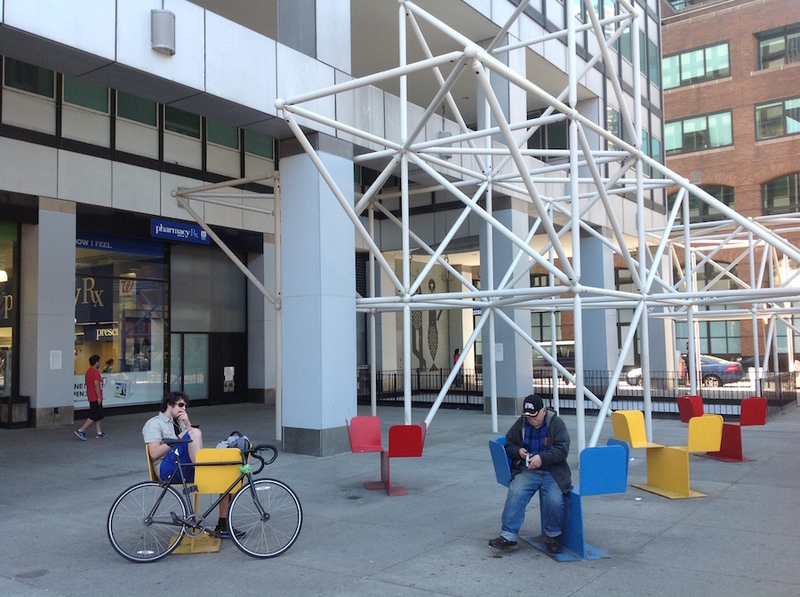 But now, Department of City Planning (DCP) has proposed a zoning text amendment to enliven the quiet downtown stretch by allowing for seating, art installations, food trucks, concerts, and other such events and amenities on privately owned public spaces (POPS). Sprinkled throughout the city, POPS are unique public areas that are maintained by developers for public use in return for more floor space in their development. This slice of downtown is a mix of commercial and residential buildings, and has a shortage of amenities to offer residents and employees in the area. 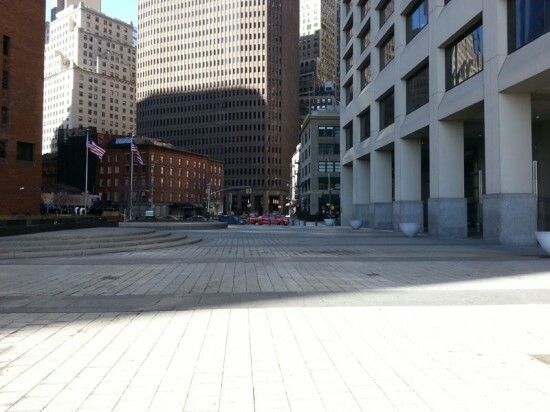 DCP hopes to change this and turn Water Street, extending from State to Fulton Streets, into a “Public Space Activation Area” for a variety of activities such as farmer markets, concerts, food tastings, festivals, cultural exhibitions, and performances for this coming summer, spring, and holiday season. The City Planning Commission green lighted the proposal back in April, and next City Council will make the final decision by June 29th.